Here’s another interesting fact. Taxes today are lower than they were on inauguration day 2009. Back in January 2009, the CBO projected that total federal tax revenue that year would amount to 16.5 percent of GDP. This year? 15.8 percent. One last nugget. The deficit this year is going to be lower than what it was on the day President Obama took office. Back then, the CBO said the 2009 deficit would be 8.3 percent of GDP. This year’s deficit is expected to come in at 7.6 percent. The fact is that Obama inherited a disaster of a federal budget. Eight years prior, when President George W. Bush took the oath of office, there was a $281 billion surplus. By the time Obama was sworn in, he was facing a $1.2 trillion deficit. 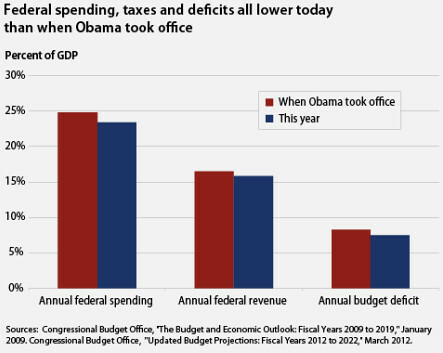 Inconvenient though it may be for conservatives (especially those who are running for president), the truth is that spending, taxes and the deficit are all lower today than when President Obama took office. GDP has grown as the recession receded. This is good news. The reason for this is that the economy is recovering, albeit, slowly. Just think how much further along the recovery we would be if not for the obstruction by the Republicans in Congress (example: their refusal to pass the Jobs Bill or increase taxes on millionaires and billionaires). In related news, according to the May 14th AAA Fuel Gage Report (http://newsroom.aaa.com), the national average price at the pump has now declined for 28 consecutive days and is 21 cents lower than the April 6 peak of $3.94. This streak of declining prices is the longest since 2010. As of Monday, the national average price for a gallon of regular self-serve gasoline is $3.73. This is five cents cheaper than the price one week ago, 17 cents cheaper than one month ago and 24 cents cheaper than one year ago.